With 25 total sets released, 2000 is tied with 1999 for the most sets ever. 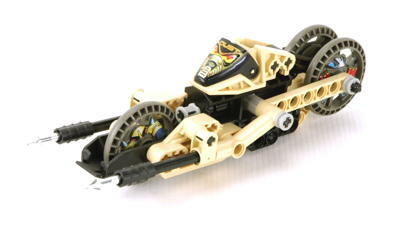 2000 also holds the record for the most diverse product offering with models in almost every category imaginable. The Tech Build / Tech Play categorization which had been in use since 1995 more or less ceased to exist this year although the numbering groups of 8200 and 8400 remained for a bit longer. 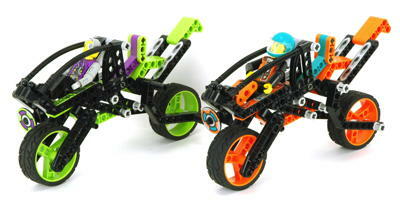 Only 2 of the 25 models could be considered traditional Technic. In addition to this there was a fully motorized racer. 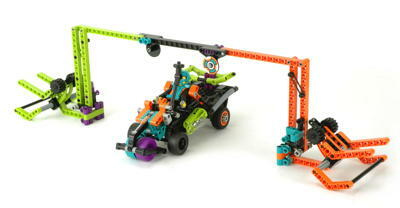 2 new Competition play sets were released which were quite different in color and concept than the previous models. 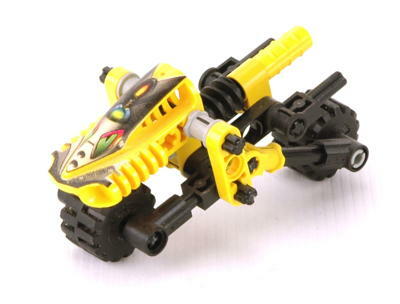 A new type of play set called Speed Slammers was introduced with 3 models. 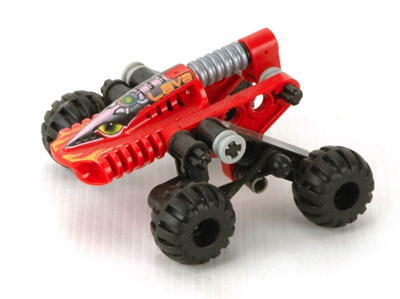 These included a launcher that could be used to propel the vehicles across the floor. 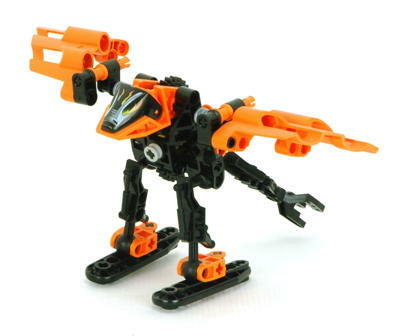 3 new models in the Slizer theme were released, the last in that theme. 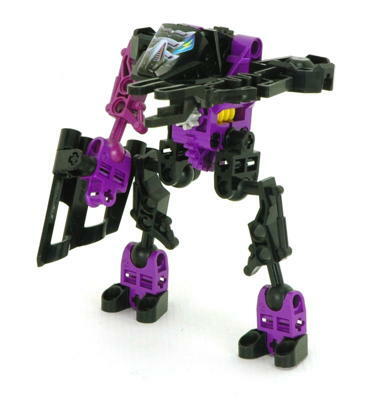 A new type of very simple play set was released called RoboRiders. 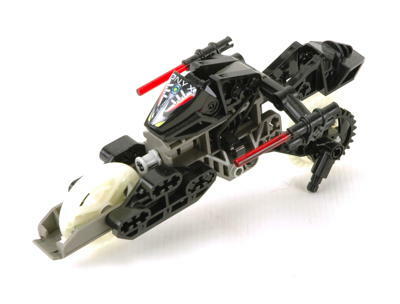 Similar in concept to Slizers, these were further precursors to Bionicle which used different construction methods and parts than typical Technic. There were 11 models in this theme. 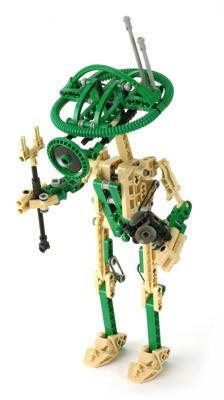 Finally, the Star Wars theme expanded into Technic with 3 models of droids with minimal functionality. If this sounds like a lot, it is. 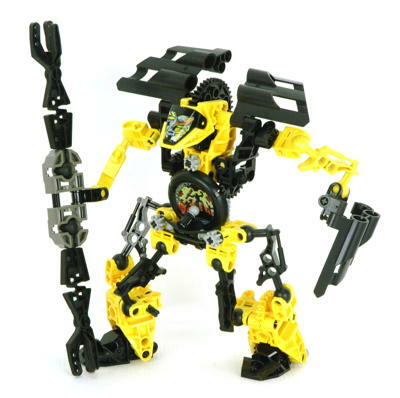 At this point in time, it would be very difficult for anyone to describe what "Technic" was or tell you how to distinguish a Technic model from any other model. This was intended to expand the market but also resulted in a dilution of the brand to the point that it almost didn't mean anything. In the future the company would go to considerable effort to do exactly the opposite of this: strengthen the Technic brand with consistent product offerings. The two largest models of the year were very impressive and unprecedented. The 8457 Power Puller is a subject that is obscure to many parts of the world and contained the largest tires ever as well as 20(!) engine cylinders. 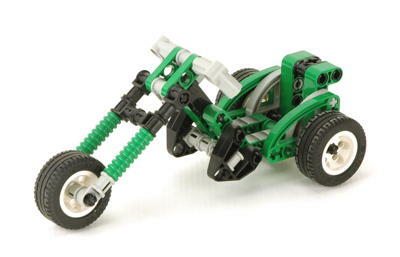 The 8458 Silver Champion was one of the physically largest models ever which uses a totally new color and new tires, wheels, and suspension. The studless system received many new parts. 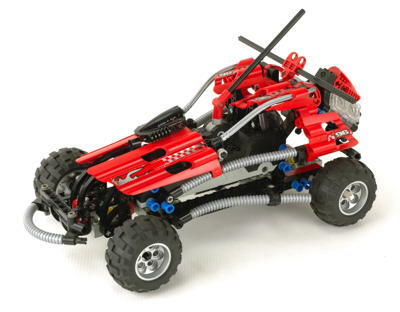 At this stage, traditional Technic bricks and studless beams were fully integrated resulting in the most rigid and solid chassis construction in Technic history. 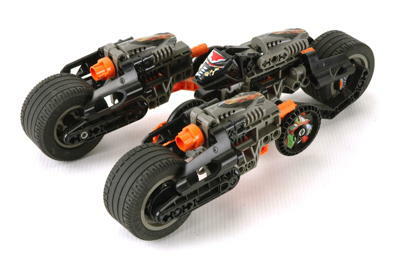 This year also featured 6 supplemental sets or "packs" which could be used to modify or expand other models: a pneumatic pack, a styling pack, a chassis pack, a silver wheel pack, a motorized base, and a speed computer. The studless system was significantly expanded this year. A series of half thickness L-shaped liftarms (shown in black) were released which have a curved reinforcement (3x3, 3x5, 5x7). These very sturdy parts are very useful for reinforcing structure and can also be used decoratively due to the smooth surface. 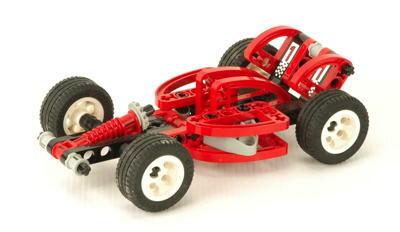 Two more angled liftarms (shown in red) were released (4x4, 7x3) to compliment the existing 6x4. Finally, the most ubiquitous studless parts of all, straight beams (shown in blue), were introduced this year. The first lengths were 5 and 15. 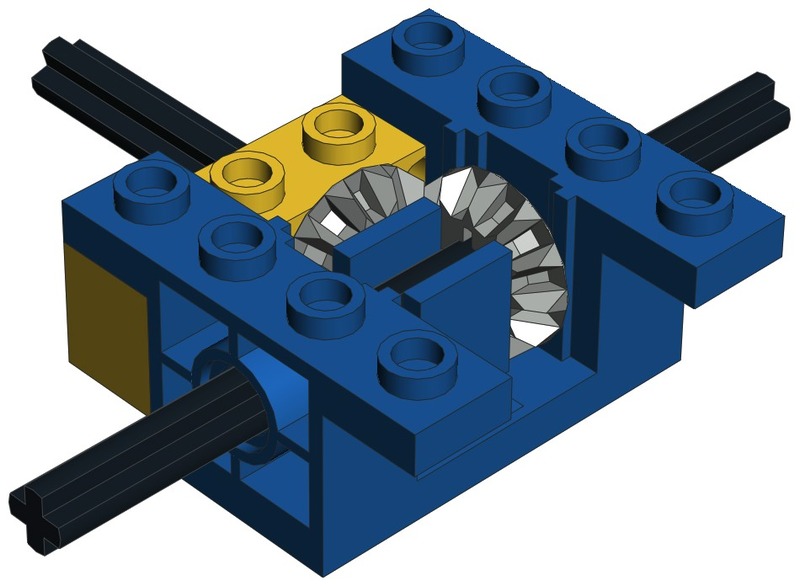 It may be noted that studless beams come in odd lengths while Technic bricks come in even lengths. 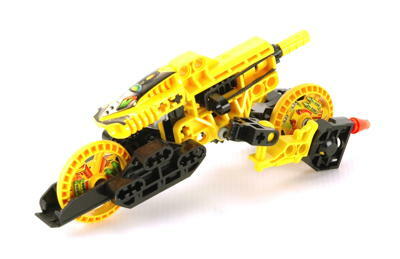 However, this is not as different as it may seem because a 16L Technic brick only has 15 holes, the same as a beam. 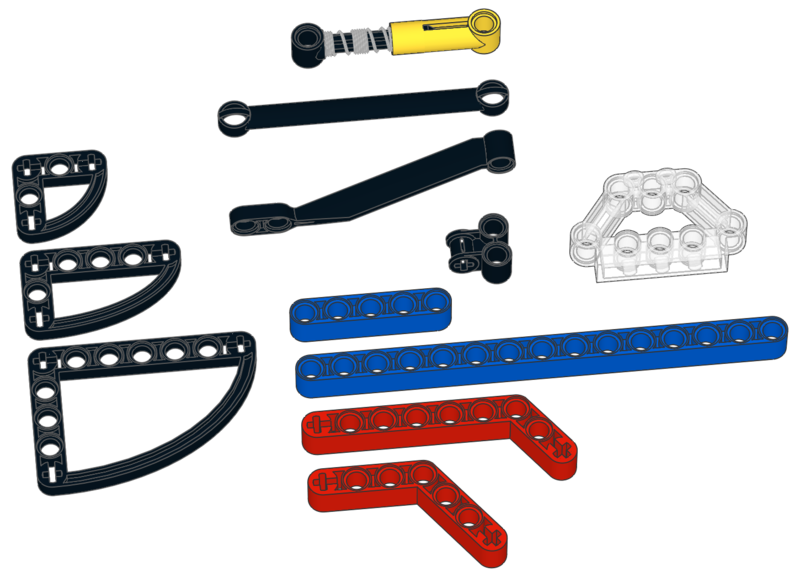 It is possible that these studless parts were designed more with the Star Wars theme in mind than for use in traditional Technic models. 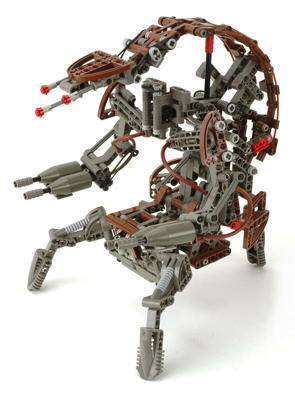 It would be several more years before Technic would go totally studless, but the Star Wars models already used this building style exclusively. 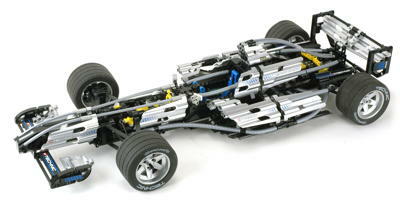 The Silver Champion included several new parts intended to simulate a Formula 1 pushrod type suspension. The first of these is a wishbone arm. 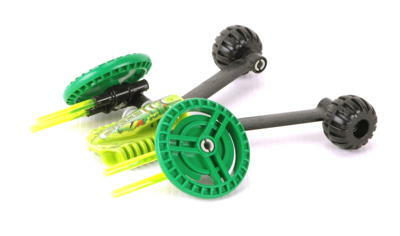 A set of 4 of these can be used to create an aerodynamic double wishbone of a single wheel. 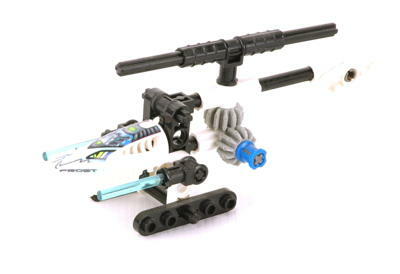 These parts were occasionally used in the future for other uses. The next suspension part is a 9L rod or link. The existing 6L link is to short to be compatible with the long wishbones. The 9L link was used both as a steering rod and as a suspension pushrod. Finally, the 6.5L shock absorber got a new variant with a much stiffer spring. This version can be distinguished by being yellow as well as having a visibly different spring. A perpendicular connector was released with an axle hole and two pin holes. The thing which makes this part special is that the axle hole is centered beneath the pin holes. Use of this part therefore allows a 1/2 stud offset. Finally, a engine block support (shown transparent) was released which has a built-in angle and pin holes to support engine cylinders in a V configuration. 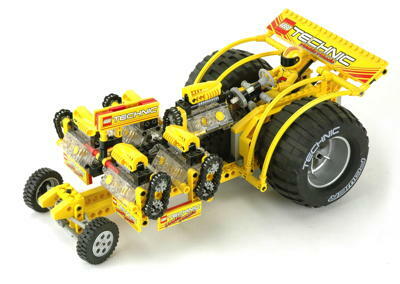 This made Technic engines stronger and easier to build. 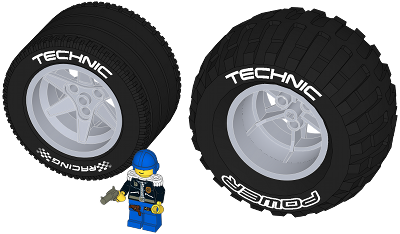 Both the Power Puller and the Silver Champion introduced new wheels and tires, the largest of their respective types ever (a minifig is pictured for scale). Both sets used the same wheel, a metallic silver painted wheel of great diameter and depth. 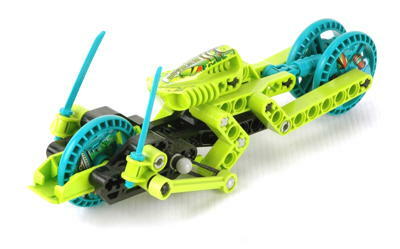 The wheel is reversible and looks quite different from each side. 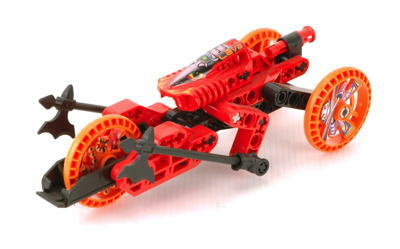 Note that the wheel has both a central axle hole as well as 3 pin holes in a triangular pattern. At this point, no rub existed to use the pin holes. The Silver Champion racing tires have a grooved tread from Formula 1 at the time. The Power Puller tire is a balloon tire with a lot of internal volume and compressibility. Both tires have printing on the surface, a very unusual practice. 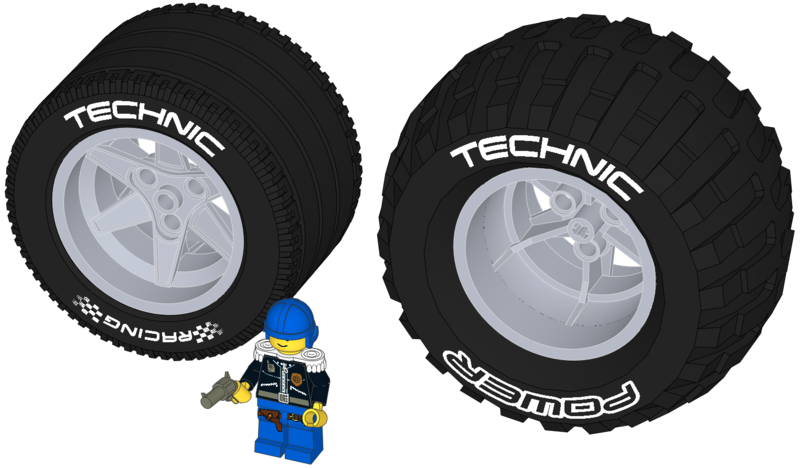 These tires were no doubt very expensive and are quite rare, though both did appear on at least one subsequent model.